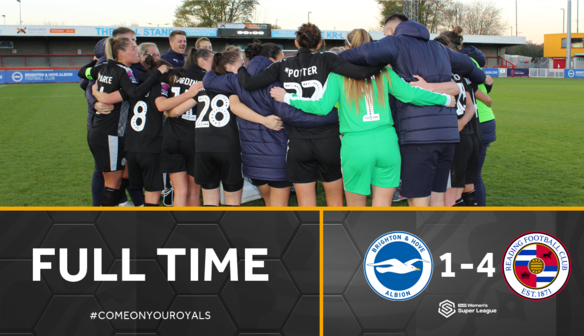 After a two-week International break, the Royals were back in FA WSL action at Brighton & Hove Albion. Kelly Chambers' side were looking to continue from where they left off, having beaten Bristol City 3-0 in their last match. It was a slow start with little action in front of goal as neither team could implement much quality in a rather scrappy opening. Rachel Furness tried her luck from distance, while Jade Moore and Brooke Chaplen forced Brighton goalkeeper Marie Hourihan into routine stops. 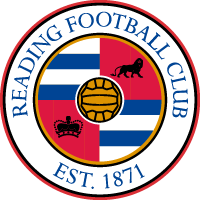 Reading opened the scoring 20 minutes in through the help of Hourihan. Furness dinked a cute ball into Fara Williams who volleyed towards goal. It struck the post before hitting the back of Hourihan and trickling into the corner. An unfortunate own goal from the Albion shot-stopper. The first booking went to Brighton's captain Danni Buet for a foul on Lauren Bruton less than half an hour in; a challenge that forced the forward to come off through injury. 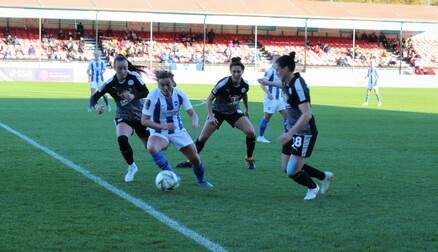 In first half stoppage time Hourihan had to be alert as she tipped Williams' strike over the bar. Minutes later, Williams struck again, just wide from 25 yards. Jo Potter also hit the outside of the near post directly from a corner before the break. The hosts' response was imminent as they halved the deficit 2 minutes later. Ini Umotang's cross was headed in at the near post by Aileen Whelan. The Royals restored their two-goal cushion shortly after through Williams. A shot from almost 30 yards was palmed into the air by Hourihan before coming down and bouncing over the line. The game was effectively put to bed with 9 minutes remaining as Gemma Davison's strike deceived Hourihan and found the back of the net. Manager Kelly Chambers: "It was important that we built on our result and performance against Bristol City. But, in the first half we were a little bit slow out of the blocks." "The girls were magnificent today, (in ensuring) we've come away with the points but also some more goals on the board." Full-back Maz Pacheco: "We've been working hard, and that showed in today's game. It's credit to the girls and credit to the staff."